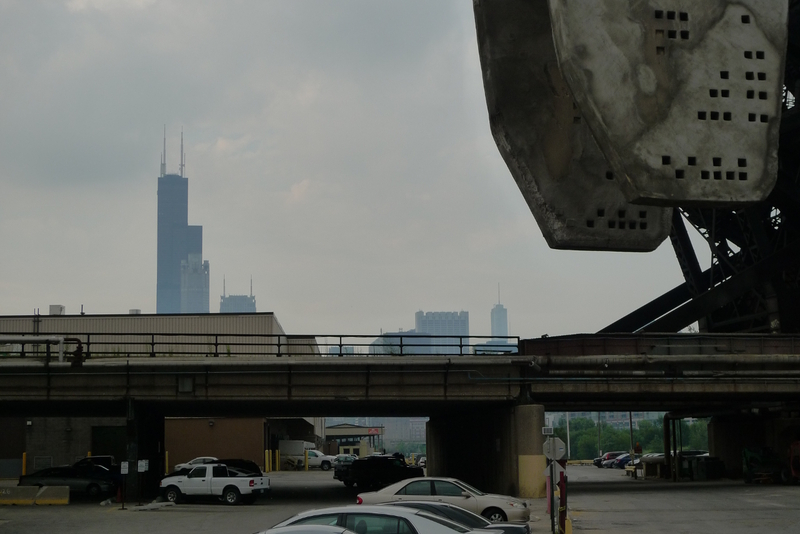 When riding down Roosevelt Road in Chicago, one can spot a strange and mesmerizing shape looming in the distance. 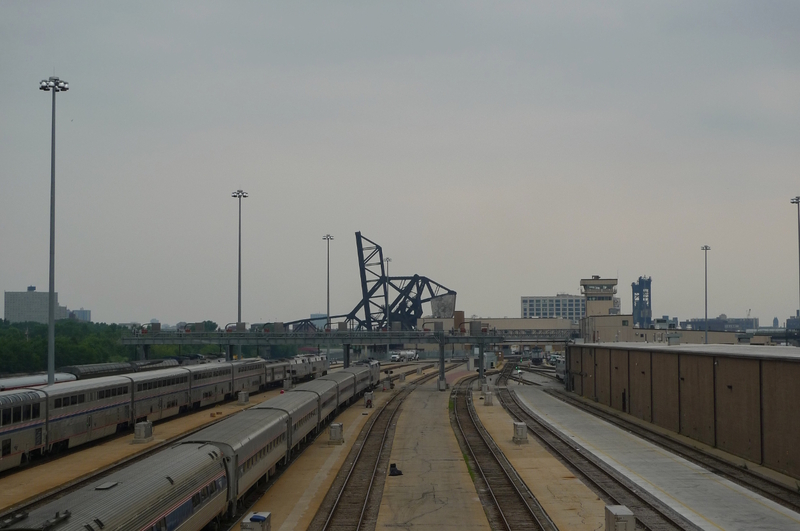 Upon closer inspection, what first appears as meaningless and abstract mass of steel turns out to be two adjacent railroad bridges: the Baltimore and Ohio Chicago Terminal Railroad Bridge and St. Charles Air Line Bridge. Both of them were raised towards the beginning of the last century. 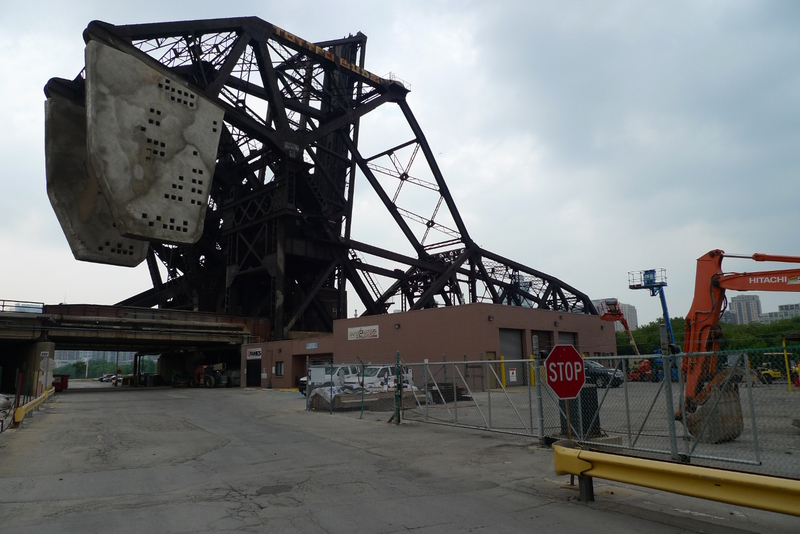 The St. Charles Air Line Bridge, which is the southernmost of the two, being in the lowered position in the photos, was built in 1919 and had been designed by the Strauss Bascule Bridge Company. 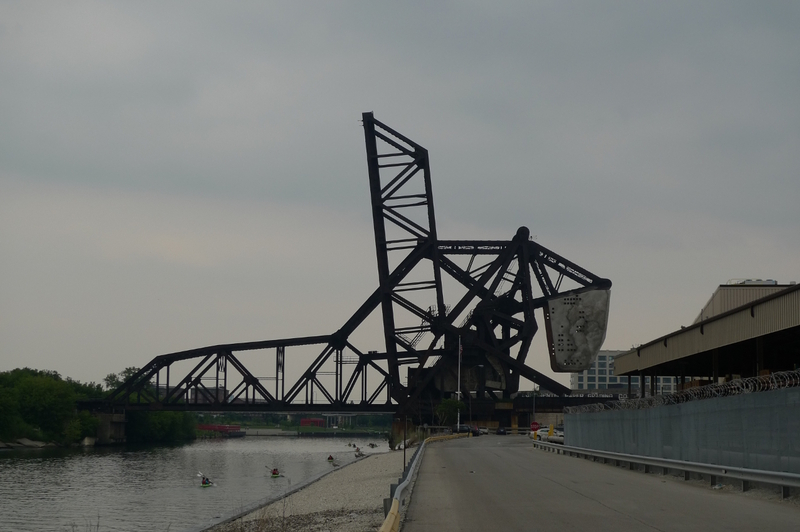 Originally, it was 40 feet longer than today, making its span (or ‘leaf’) of 260 feet the longest among all the world’s bascule bridges at that time. As the future project to move and straighten the river had been already initiated by then, the bridge was designed in a way that allowed it to be relocated and shortened. 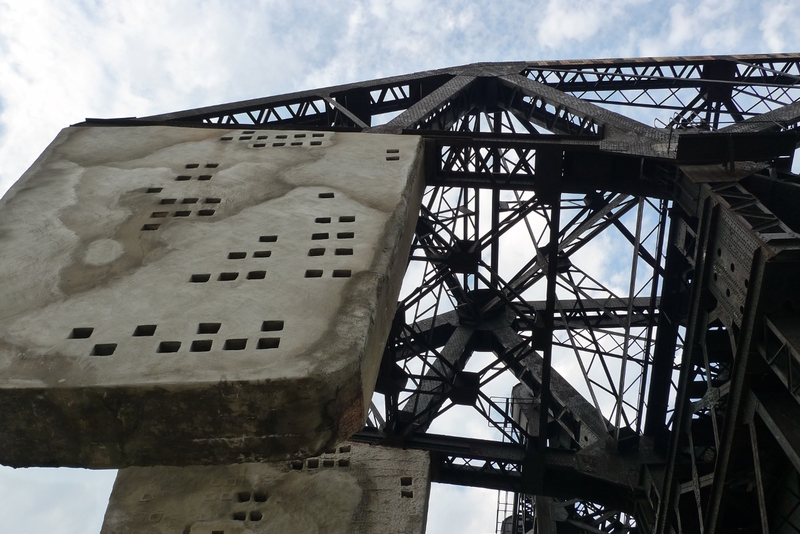 Indeed, in 1930 the leaf of the bridge was reduced to its current length of 220 feet. 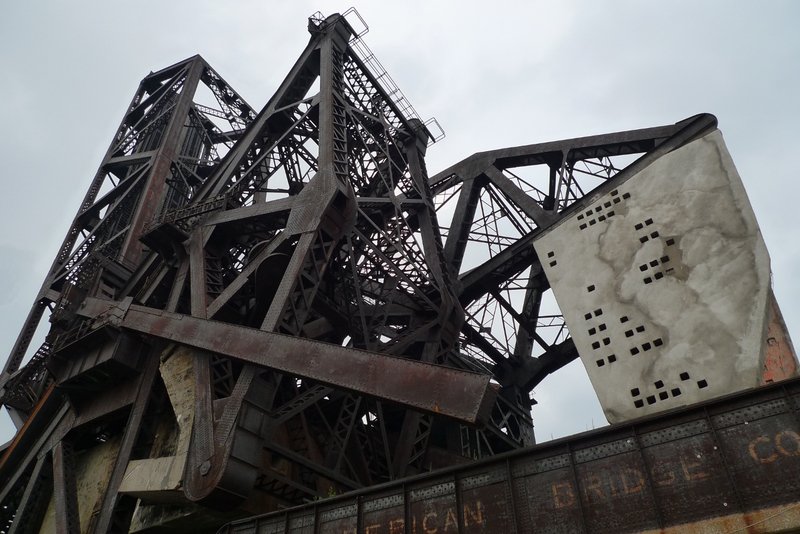 The name ‘bascule bridge’ itself comes from a French term for a balance scale, which employs the same principle. This type of construction allows a bridge to open quickly and requires relatively little energy to operate. 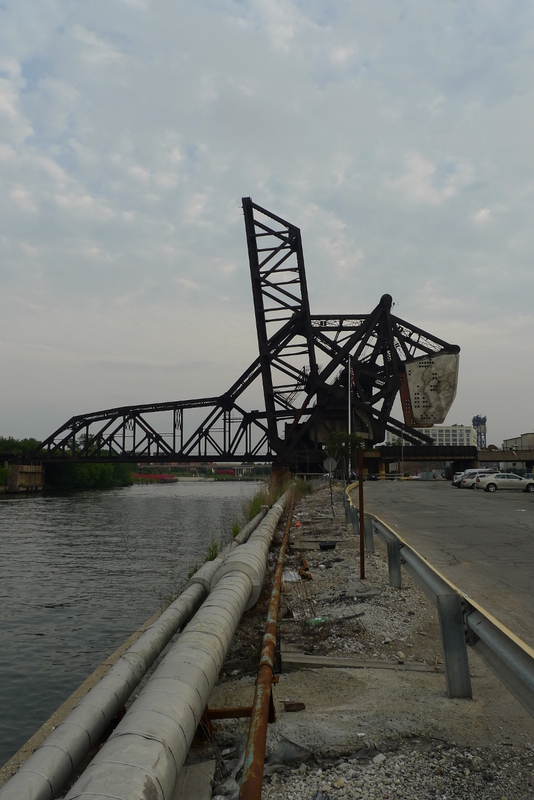 The Baltimore and Ohio Terminal Railroad Bridge is the northernmost of the two, found in the raised position in the photos. It was built in 1930 after the river has been realigned, and is 186 feet long. It employs the same operation principle, well-established by this time. This bridge is no longer used – its leaf is permanently raised, its counterweights are curled up underneath and the tracks leading to it have disappeared long ago. 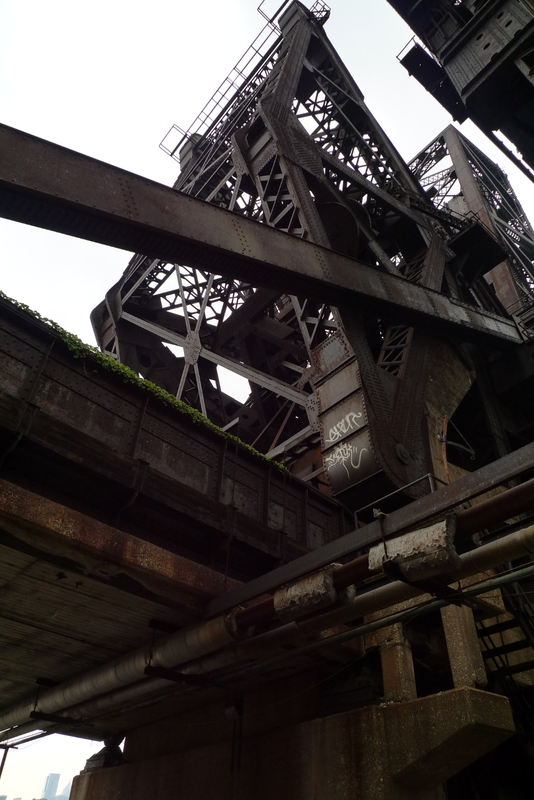 At close quarters, the bridges are a magnificent tangle of heavily-bolted steel girders and massive concrete blocks. 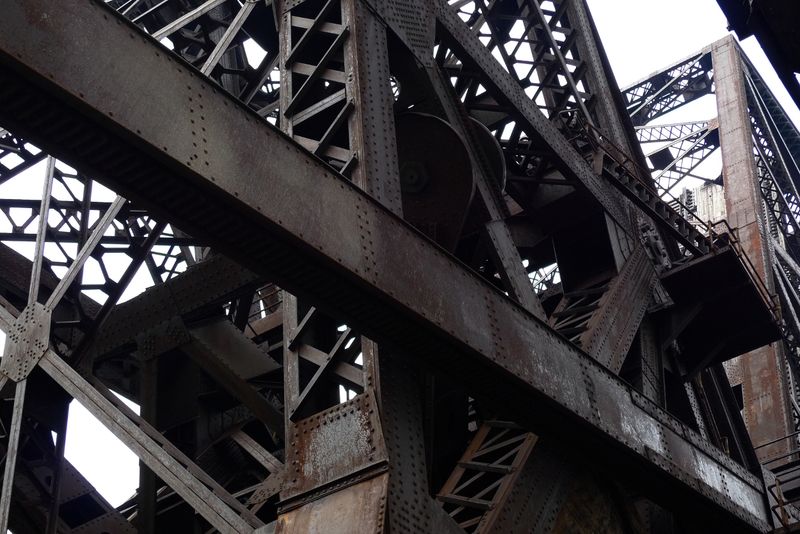 The effect is magnified by the fact that both bridges have not been spared by rust and time. Thus it was all the more shocking to find that not only is the St. Charles bridge still in use, but moreover, its mechanism is in perfect working condition! Most importantly though, they both are poetic works of art. Just take a look. It is hard to miss how ridiculously massive the enforced-concrete blocks are. The impression becomes especially overwhelming in the case of the blocks belonging to the St. Charles bridge, which are suspended on both sides of the railroad and thus make it possible to stand right below them. All I’m going to say is that it’s an interesting feeling. 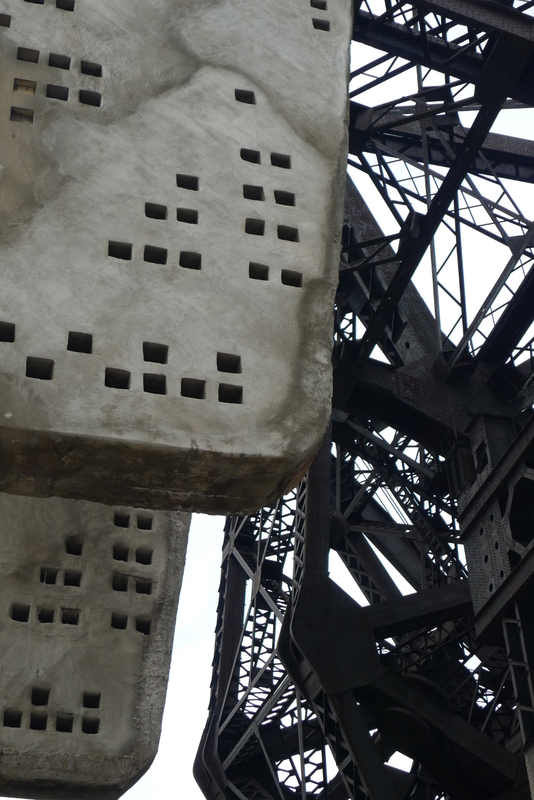 I am also curious about the purpose of the square holes in these blocks (note that the blocks of the Baltimore and Ohio bridge have no holes at all), which are very harmoniously and artfully distributed. I suspect they might have something to do with the fact that initially the bridge was longer and, therefore, heavier. 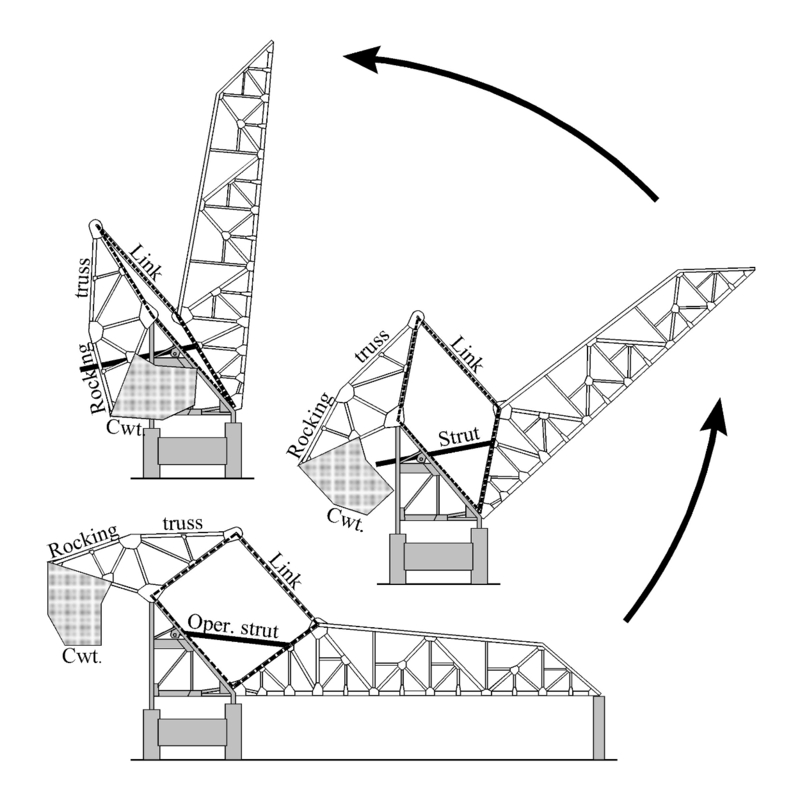 It would be rational then to equip the blocks with weights that could be easily removed once the structure of the bridge were to change. Is this true though? The internet remains silent. 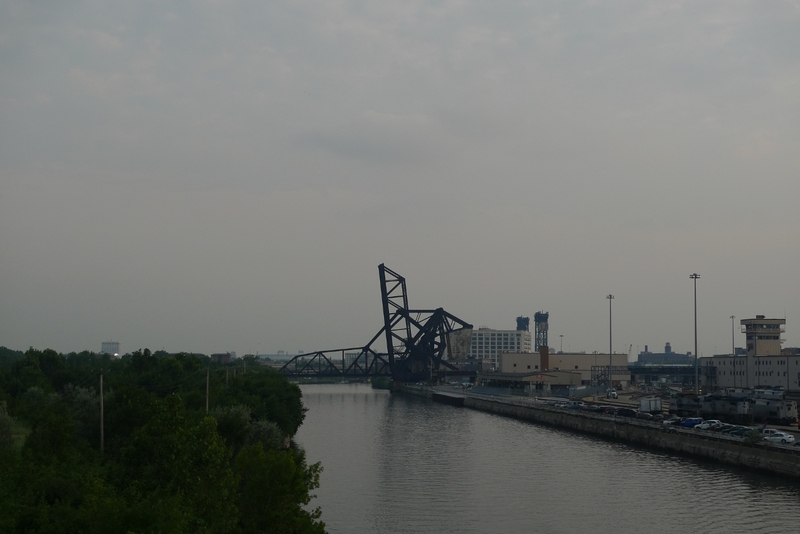 Both bridges are important historic structures, being an indisputable engineering success of their time and having been designed by one of the city’s most notable engineers. Therefore it baffles me that anyone would want them torn down. 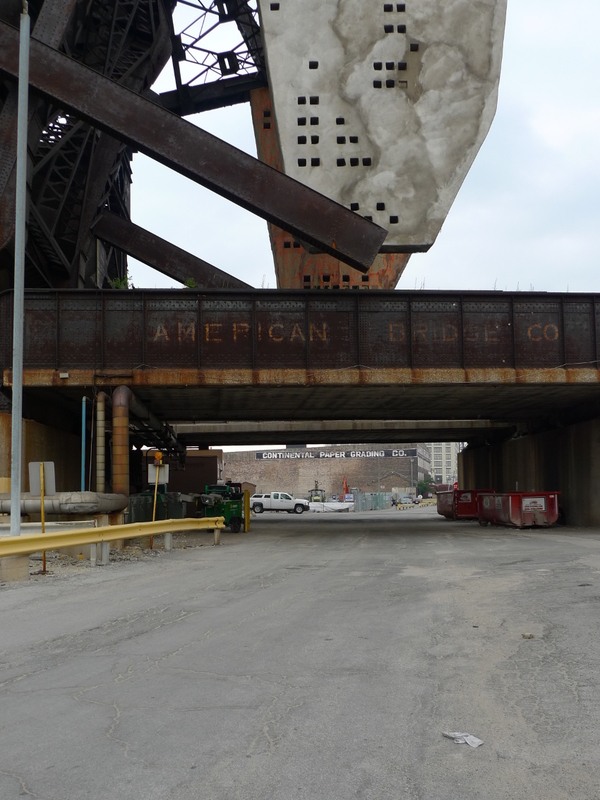 Still, this seems to be true: there is talk of the bridges being nothing more than useless remnants of the by-gone era, reinforced by opinions that they esthetically clash with the modern downtown and residential developments built in the area. 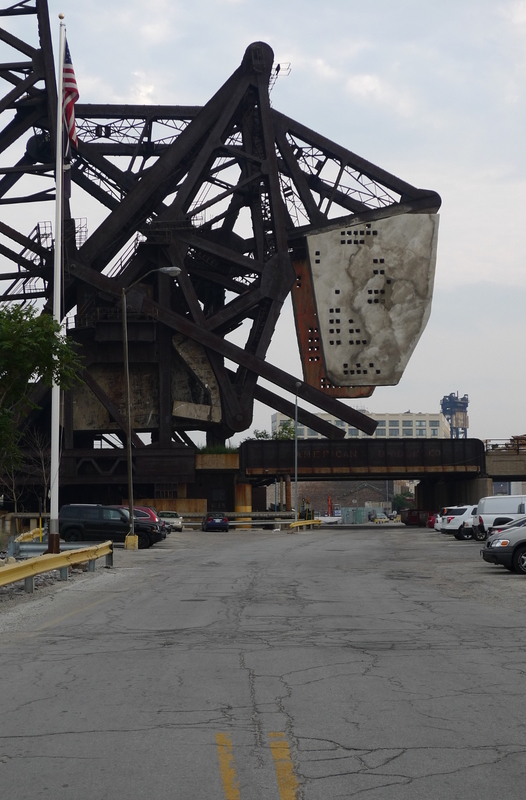 As of this day, the bridges are protected as Chicago Landmarks, meaning that their demolition would require the approval of council. Despite that many websites cite their status as ‘facing possible closure/demolition’. Well, the bridges are still there, and they should remain so as long as the right officials are in place. Admittedly, so far Chicago has been a place where the old met the modern, and usually in a very refined way. I can see no reason why this shouldn’t continue to be true in this case. PS2 Don’t read any further if you don’t want your perception of the bridges to be changed forever. From afar, the two bridges look like a Pegasus. 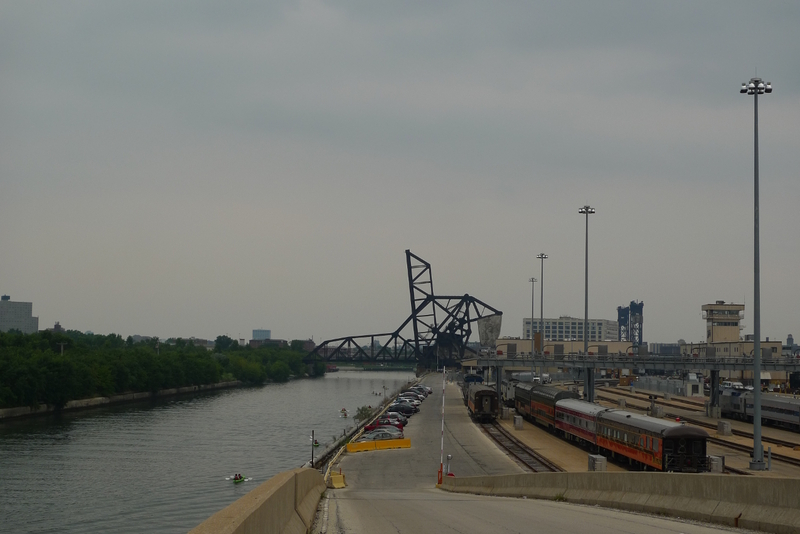 This entry was posted in Bridges, Chicago, Chicago River, Industrial, Travel and tagged Bridges, Chicago, Chicago River, Industrial, Travel. Bookmark the permalink. Those are great close up shots of the bridge! Very cool stuff and thanks for sharing the post with me! I’m glad you liked it, and thanks for stopping by!